Huge lot as shown Mostly great, may have a spot or two Nice mixed set you get all the pieces shown. Coin for size comparison Thx Dollhouse Miniature 1:6 Scale Tea Set For Barbie Doll23 Pcs Po Some Vintage. Condition is Used. Shipped with USPS First Class Package. Dollys Gallery. Made by Reutter Porcelain in Germany. 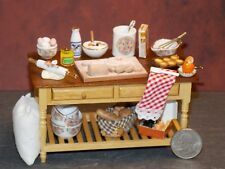 Dollhouse Miniature Kitchen Baking Table. A nice addition to any doll house collection. REUTTER PORCELLAN "TEA TABLE & ROSE FAIRY TEA SET"
THIS IS A REUTTER DOLLHOUSE TEA TABLE WITH A MARY CICELY BARKER TEA SET OF THE ROSE FAIRY. IT ALSO HAS A SPOON AND NAPKIN. THE LITTLE TEA TABLE IS WONDERFUL AS IT IS FINISHED IN A LIGHT MAHOGANY AND IS A PEDESTAL STYLE TABLE. Dollys Gallery. Made by Reutter Porcelain in Germany. Old Fashion Victorian Stove. Tea for two Miniature tea set in great condition for any little dolly or dollhouse. THIS IS A REUTTER DOLLHOUSE "DINNER FOR TWO SET" DUCK PATTERN. IT IS A BEAUTIFUL SET WITH A LARGE SERVING TRAY, A SOUP TURENE AND LADDLE, GRAVY BOAT AND DISHES. I AM SURE THIS PATTERN WAS POPULAR IN THE ENGLISH COUNTRY SIDE. REUTTER DOLLHOUSE "GOLD CROSS DINNER FOR TWO"
THIS IS A DOLLHOUSE REUTTER PORCELAIN "GOLD CROSS DINNER SET FOR 4. IT IS ALL PORCELAIN WITH A DAINTY GOLD CROSS AND EVER SO TINY PINK ROSES AND JUST A TOUCH OF BLUE. IT HAS A SERVING PLATER, A SOUP TURRINE, A GRAVY BOAT, A GOLD LADDLE & HOLDER, A BOWL AND FOUR PLATES. This is a fine little porcelain miniature featuring a painted rooster and a number 5. I'm not sure who handcrafted this but it is nicely made and feels like porcelain. Maybe it's a lemonade dispenser or water jug. Rutter Porzellan of Germany has an established reputation for creating high quality elegant dollhouse miniatures, well-crafted and beautiful to behold. Reutter Porzellan has been creating miniature porcelain since the early 1950's. Steiff Mini Porzellan Set. Adorable miniature tea set decorated in great detail with Steiff bears and logos. I will respond as quickly as possible. LUSTER WARE. FROM GERMANY. I NOTE ANY FLAWS I MIGHT FIND AND TRY NOT TO MISS ANY. MOST STUFF IS EITHER NEW OR GENTLY USED AS NOTED. •Zella - Dane Jan 9, 1910. •Handpainted flower design. •plate is 1 1/2" across cup is 3/4" h. Get Supersized Images & Free Image Hosting. 4 1/2" H (larger teapot). Tea Set - 8 pieces. with light wear due to age;. (yellow spots). will need light cleaning. In good condition. From Aztec Imports collection of detailed dollhouse miniatures. This will make a nice addition to your miniature scene. DOLLHOUSE MINIATURE 50 PC TEA SET 1:12 SCALE. 1in to 1ft. 1:12 Scale. This is sized for a dollhouse. I also try to recycle, so an envelope or a box that your item arrives in may have been used before, but it will be strong, safe and secure. or bubble wrap to insure safety and/or cleanliness. Fantastic item! Antique Doll PINK BEAR TEAPOT PITCHER. This adorable pink bear pitcher is very old. 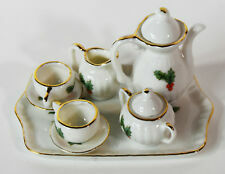 Lefton Tea Set - 8 pieces. 2" H (teapot). with light wear due to age;. plates are approx. 2" H (teapot). with light wear due to age;. Tea Set - 7 pieces. In good condition. DOLLHOUSE MINIATURES. BLUE AND WHITE PORCELAIN SET. SEE PICTURE WITH QUARTER NEXT TO PLATE FOR SCALE. ON LARGER SIZE. TEA SERVICE SET. I NOTE ANY FLAWS I MIGHT FIND AND TRY NOT TO MISS ANY. MOST STUFF IS EITHER NEW OR GENTLY USED AS NOTED. 1 3/4" H (teapot). Tea Set - 18 pieces. with light wear due to age;. This is another unusual item from Reutter Porcelain. It consists of a whole fish on a white, gold rimmed plate, with a small saucepan in the older Blue Onion pattern. This too is rimmed in the beautiful Reutter gold, as is the small dish of lemons on the side. This comes from my own personal collection and has never been displayed. Please feel free to ask questions. I do combine shipping. 1 1/4" H (teapot). Tea Set - 8 pieces. with light wear due to age;. light paint loss (decals). 1 1/4" H (teapot). with light wear due to age;. Tea Set - 8 pieces. In good condition. DOLLHOUSE "4 PLACE SETTING DISHES"
THIS IS A DOLLHOUSE DISH SET WITH PLACE SETTINGS FOR FOUR. IT IS PORCELAIN AND IT IS ALL WHITE WITH A SWIRLED DESIGN. IT IS 1/12 SCALE AND A NICE NEAT LOOKING SET. Set of 3 jugs / bowls: box is 4" x 1 1/2" x 1". with light wear due to age;. set of 2: box is 3" x 2". tea set - box is 3 1/4" x 2 1/4" x 1/2". No sets - all mixed. a couple chipped. Tea Set ( Lots). 10 plates / bowls. In good condition. Wonderful little piece for your dollhouse! I would keep, but not my style. Non electric. 1 1/4" H (teapot). Tea Set - 26 pieces. with light wear due to age;. light paint loss (decals). One set is marked "Small Treasures". Small Treasures set Second set Teapot: 1 1/4". Plate: 1 1/8". Sugar bowl: 1 1/2". Pitcher: 1 1/4". 2" H (teapot). with light wear due to age;. Tea Set - 6 pieces. In good condition. SIZES: MUGS - 5/8" HIGH. 7 PIECE MINIATURE TEA COFFEE SET. SUGAR TRAY - 3.25" X 2 1/8". This high-quality porcelain bathroom features hand-painted gold accents with rich brass finish hardware. Perfect addition to your dollhouse, miniature scene or classic setting. This product is a scale miniature and not intended for children under 14 years of age. This is a miniature hand painted pitcher by a unknown maker. It is white with an intricate floral design on it, and brown edging.